Greyhound racing soon became a sporting event in England. When settlers arrived in America, Spanish and English explorers brought Greyhounds with them to the new land. The Greyhound was one of the first breeds to participate in dog shows and was recognized by the American Kennel Club as an official breed in 1885. Greyhounds are well-tempered and generally friendly. Some dogs are shy, however being gentle and giving them a treat will make them love you in no time at all. This is an intelligent and independent breed, often being described as cat-like. Greyhound temperament is dependent on their genetics, training, and socialization. Meet at least one of the parents, if possible, so you can get a better understanding of what your dog’s temperament will be like. Greyhounds can have a shy or timid personality, so it’s important to socialize them early on to ensure they won’t be sensitive to new people, sights, and sounds. Taking your dog on walks through the park, enrolling them in puppy classes, and bringing them to stores that are dog-friendly will help socialize your Greyhound puppy. Other Greyhound personality traits include active, quiet, and affectionate. Training a Greyhound can be difficult. They tend to be stubborn and try to find ways out of tasks they do not want to do. You should start training your Greyhound as soon as he gets home for best results. Keep in mind that your Greyhound does what they want, so harsh training methods will not do well with them. Reward them with love, praise, and food when they do well. You may find that they struggle with the command “sit” because that is not a natural position for them. Even though it ‘s hard to train Greyhounds commands, they are relatively easy to house train. Contrary to popular belief, Greyhounds do not need much exercise. They are race dogs; however, they are built for speed, not stamina. Greyhounds require just one walk a day to keep them a healthy weight. As with many breeds, if they do not get proper exercise, they will become bored and destructive. Make sure to keep them on a leash while you walk them; sometimes their prey instinct takes over when they see other animals, they will chase after them. Their incredible speed means they will outrun you, so keep them on a leash just to be safe. Due to their large size, a Greyhound lifespan is shorter compared to other breeds. Usually, Greyhounds live to be 10-12 years old. How Popular Is the Greyhound Breed? Greyhound’s popularity in America is still relatively low compared to other breeds. The American Kennel Club ranked them as the 151st most popular breed in 2014. How much food your Greyhound gets is dependent on his age and gender, as the gender of your dog does affect his size and metabolism. Male Greyhounds should get 2.5-4 cups of food a day, split into two meals, and female Greyhounds should get 1.5-3 cups of food a day, split into two meals. Because of their large size, make sure to have fresh water always available. Grooming a Greyhound takes minimal effort, due to their short coat. Keep in mind Greyhounds do shed and running a rubber brush through their hair once a day will help with the build up of hair. They don’t need to be bathed often, but when they do, be sure to dilute their shampoo with water or use a dry shampoo. Ensure the water is warm because if the water is too cold, they can go into shock. Their coat also needs to be thoroughly cleaned, as their skin can get irritated if shampoo is not completely washed out. For optimal Greyhound health, trim their nails about once a month, in order to prevent breakage or overgrowth. Greyhounds tend to have dental problems, so it is crucial you brush their teeth about 2-3 times a week to prevent the buildup of plaque and tartar. Greyhounds can be good with kids. It is imperative you watch the interactions your children have with your Greyhound, as Greyhounds can quickly become overwhelmed and try to hide. Teach your children how to interact with your Greyhound, gently and with patience. This will create a happy family dynamic. Anesthesia Sensitivity: Due to their low body fat, Greyhounds could die if given the same amount of anesthesia that other dogs their size are given. When looking for a vet, make sure you find one who knows that Greyhounds have a sensitivity to anesthesia and some other drugs. Gastric Torsion: Gastric Torsion, also known as Bloat, is a potentially deadly Greyhound medical issue that affects many deep chested breeds. 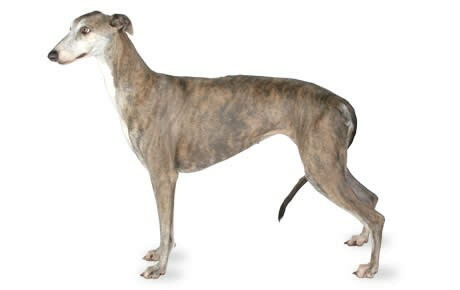 Gastric torsion occurs when your Greyhound eats too much at one time, eats too much then drinks too much, or eats too much and then exercises. Air or gas can get caught in their stomach, and then their stomach twists. They can’t release the air, preventing normal blood flow, and soon blood gets trapped and can’t circulate to the heart. At this point, your dog will most likely pass out. Take your dog to the vet if he is retching without throwing up, excessively salivating, or acting restless after eating. Osteosarcoma: Osteosarcoma is an aggressive bone cancer that usually affects one of the Greyhound’s legs. The first symptom of osteosarcoma is lameness, however you will need an x-ray to verify that it is osteosarcoma. Treatment for this health issue usually involves amputating the limb or chemotherapy. While this may be upsetting, dogs adapt to having three legs quite well and they don’t suffer from many of the same symptoms humans do when going through chemotherapy, such as nausea and hair loss. Periodontal Disease: For racing Greyhounds, their diet consists of high bacteria food, which can cause a buildup of plaque on their teeth. The plaque and tartar buildup will push back their gums, eventually revealing the tooth root. Once the bacteria has gotten this far, it usually goes into the bloodstream and can affect their heart, kidneys, and liver. Signs your Greyhound has this medical issue include yellow or brown crust near the gum line, loose or missing teeth, and bad breath. Separation Anxiety: Separation Anxiety in Greyhounds, particularly with those who used to race, is a prevalent issue. Racing Greyhounds stay with their litter mates and mother for the first year of their life, unlike other dogs who are separated from their family after 8 or 10 weeks. Then, they go to race track training with their siblings. They spend their whole racing career with other Greyhounds. Greyhound anxiety may occur when they retire and are placed in a home where people leave for hours at a time, they may experience separation anxiety. If your retired racing Greyhound has separation anxiety, try putting him in a crate when you leave. Many of these dogs are used to being in a crate, and it may help him keep calm. It will also prevent him from causing destruction around your house. I noticed after about 2 weeks a reverse sneeze that nagged him had simply disappeared! I indulge her of course, as her treats seem to be helping her with many of her issues!! Keep up the good work Canna-Pet! !